Click on a location to view a more detailed description. Victoria stands like a crown jewel on the southern tip of Vancouver Island. Boasting one of the most beautiful harbors in the Pacific Northwest, it's a terrific destination and perfect jumping off point as you explore the serene and pristine beauty of the Gulf Islands. Join people from all over the world to see Buchart Gardens with over 25 acres of flowers representing four distinct landscaping styles, Japanese, English, Italian and the unique Sunken Garden complete with lighted fountains and waterfalls. A small cove located on the eastern shore of Tod Inlet provides great anchorage and access to the gardens. You can even enjoy the nightly fireworks and concert in the park while comfortably seated in your yacht, what a life! Rocky shorelines and miles of beaches invite you to board your dinghy to view tidal pools teeming with starfish and sea anemones in every conceivable color. Distant silhouetted islands illuminated by the setting sun offers views beyond anything you have ever seen. Just to the northwest of the San Juan Islands lies the peaceful haven of the Canadian Gulf Islands. Made mainly of sandstone, the Gulf Islands offer amazing natural formations and dozens of secluded covers. Day 1 - Ship Harbor Yacht Charters to Deer Harbor Marina/Resport, 17 miles - Located on the West Sound of Orcas Island, Deer Harbor Marina/Resport and Anchorage offers fine dining with exceptional views and a swimming pool. Day 3 - Bedwell Harbor to Clam Bay or Telegraph Harbor, 30 miles - For some great sailing leave Bedwell early and go through Active Pass into Georgia Strait. Tack back west through Porlier Pass and anchor in Clam Bay or Telegraph Harbor on Thetis Island. 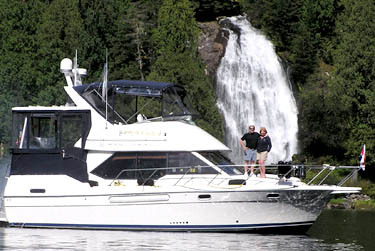 Power boaters can enjoy a very scenic inland passage along Galiano Island. Day 4 - Clam Bay or Telegraph Harbor to Todd Inlet, 28 miles - Cruise south into the Saanich Inlet. Don't forget to keep watch for Orca Whales while heading for the Todd INlet anchorage. 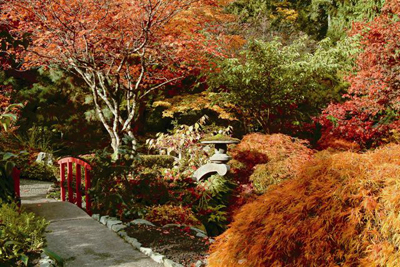 Here you are at the back door of the world renowned Butchart Gardens. Day 5 - Todd Inlet to Reid Harbor or Roche Harbor, 23 miles - For those looking for a quiet anchorange and excellent crabbing ground, Reid Harbor is just your style. Overnighting at historic Roche Harbor Resort for a night of fine dining, swimming and recreation is another option. Day 6 - Reid Harbor or Roche Harbor to Sucia Island, 16 miles - As the largest state park in the San Juan Islands you will find plenty of exceptional hiking and wildlife viewing from Echo Bay, a natural wonderland. Day 7 - Sucia Island to Shop Harbor Yacht Charters, 22 miles - Rise early and catch the tide if you can for a cruise down Rosario Strait back to Skyline Marina.